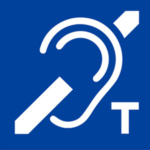 This internationally recognized sign indicates to a person living with hearing loss that the facility where the sign is displayed has installed a hearing loop system. It lets a potential user know that they need to enable the T-coil on their hearing aid or ask for a receiver to clearly hear what’s going on at the venue. If your organization has installed a hearing loop, display the sign proudly! Don’t forget to add it your website.